Considered to be one of the heaviest bands currently in South Africa, Bile of Man gained a lot of respect from fans and other bands as a result of their unrelenting brutality and intensity. In the early years of the second millenium Bile of Man started pushing boundaries with founding member and drummer Riaan Els (Ex Shadowlord, Funeral God), who employed Jacques Valentyn (Ex Mjolnir) as guitarist and co-songwriter. Shortly after, the spot of second guitar was filled by Bennie Burger. Undergoing several member shifts and changes, mid 2007 saw the first official line-up of the band consisting of vocalist Martin Bettac, Riaan Els on drums, Bennie Burger on guitar, Gustaf Erasmus on guitar and Choroz Bileous on bass. Their debut show in April of 2008 cast their live performance reputation in stone. Now known to be one of the most energetic live performances the metal scene in South Africa has ever seen. Soon after their first couple of shows, Martin Bettac was replaced by bearer of hatred, Rehan de Kock on vocals. Within the first year of the band’s life of performing live, they played alongside Death Metal masters Carcass at the last Witchfest Festival. Again going through member changes on the role of guitar, Gustaf was replaced by Jacques Valentyn and shortly after Jacques had also left the band early in 2009. During mid 2009 the band recorded their first two track demo with titles “Descendant of Desecration” and “Wrath of the Stillborn”. These tracks were put online for free downlload and interest was shown in vast numbers across the whole world. October 2009 Nicolas Sothmann (Ex Witchazel) stepped in to fill the position of second guitarist and played his first show with the band at Rocktoberfest 2009. The band had been going strong throughout 2010 playing some of the biggest metal showcases and festivals South Africa has to offer including: Ensiferum Tour of South Africa, Seasons Wither 4, Deathfest 2010, Thornfest, Motherfudd and again Rocktoberfest 2010. The band started recording their debut EP entitled: Dystopian Order: The Age of Detritus in mid 2010. Upon completion of the recording the band parted ways with long time bassist Choroz Bileous, who was replaced with Kyle Smith (Ex All Forlorn frontman). The EP was released in March 2011 on a national tour that showcased the band with their intensity, brutality and macabre heaviness on stages across South Africa, accompanied by some of the best metal acts in the country. 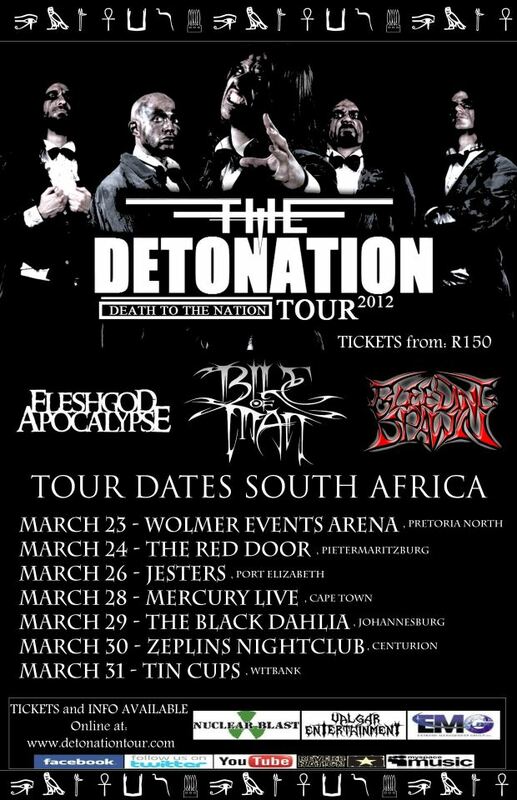 South Africa you can catch them on tour with the almighty Fleshgod Apocalypse, March 23-31 (See poster below)… for the rest of you enjoy the music video below! Next Post Help Finnish epic folk metal band Frosttide to get a gig in Nummirock!